Mobile money as an intersection of finance and telecommunication faces regulations from both these sectors. Most underdeveloped economies have a poorly regulated financial sector, with the bottom third of the population having hardly any access to banks. Mobile money has provided one solution to this situation. In India, there are an estimated 310 million savings accounts with banks. The mobile subscriber base is 680 million, out of which 32% are subscribers based in rural areas (TRAI, 2012-13). The growth rate in mobile subscriptions in rural areas is anticipated to be between 45% and 50% over the next couple of years (TRAI, 2012-13). The link between financial inclusion and information technology has been crucial, and one can observe that mobile services have succeeded in areas where banks have been unable to penetrate. The Telecom Regulation Authority of India reports that 91% of the villages in India are covered by at least one mobile network operator. However, as the network of mobile money operators scale up their services, questions of data protection also arise. What is the state of customer protections mechanisms and how willing are individuals to shift from their comfortable cash transactions to mobile money? With the introduction of mobile money in India, we wanted to research the empirical understanding about its role in replacing cash amongst migrant and non-migrant workers in Chennai (Tamil Nadu) and Hyderabad (Andhra Pradesh). We also wanted to understand the role of middlemen in this broad ecosystem. Lastly, we want to understand whether the poor trust mobile money. Migrant workers constitute about one-third of the population of India, and nearly 70% of them are women (UNESCO, 2012). They are treated as second class citizens, and are often excluded from the general economic, social, cultural, and political mainstream of society. They come from different states seeking employment, and often their first goal is to remit money home. Money transfer takes the form of hawala, the post office, the bank, or the present mobile money transfer. Using a questionnaire, we interviewed migrant workers in the outskirts of Chennai and Hyderabad among whom were both users and non-users of the mobile or non-users to their home. 1. The client’s potential to save in their home bank accounts through remittances. 2. The automatic client attraction to the product; the pull not the push strategy. 3. The employer who remits on behalf of his client has created a sub-ecosystem of mobile money over unsafe cash. This is evolving and requires further study. 4. The ‘SMS’ which the clients receive instantly has created trust and safety. Mobile money is fast catching on in India. Clients, particularly migrants have a need for it, and seem to trust the technology. Our research shows that mobile money has huge potential both from the client perspective as well as from the revenue standpoint. The runaway success of the M-PESA model which is being emulated the world over is a basic remittance model, a model to drive the client to remit money to their family. In India too, the target by many Mobile Network Operators (MNOs) is to create a single product namely a remittance product and target the same to the migrant worker. Interoperability is the mandate of India's central bank, but what seems to happen in reality is very different. We find MNOs tying clients to banks, or, worse still, clients having no access to bank accounts and left to the mercy of their employers for all of their financial needs. Many MNOs have used this basic model as their revenue model. The question that arises is what next? 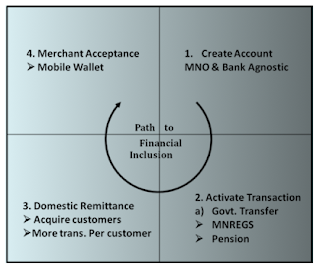 Figure 1. below is a proposed model for the mobile money ecosystem in India under we create a model path to financial inclusion for migrant workers in India. Ideally we first create a bank account and a mobile account for a client, and then allow the client to transfer money in a manner such that it is bank agnostic. Secondly, the client's account is activated so that he can receive any government transfers to his bank account while he receives a message on his mobile. It is possible for him to transact with his account from any bank/bank branch/MNO. Thirdly, the MNO goes about acquiring many customers and helps them with the basic remittance product. This follows with the client engaging in other bank products, which are asset-oriented products like savings or insurance products. The MNO then develops mobile wallets for the customer, and simultaneously finds acceptance of the mobile wallet at various retail merchants. 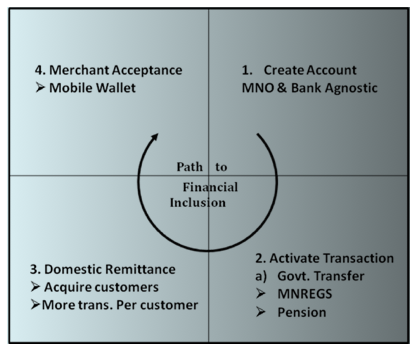 The MNO's dual role of connecting people to asset products in banks and to mobile wallets can encourage people to hold less cash, and to instead transfer value to mobile accounts. The whole process obviously requires a change in the mindset of the people. Obviously, when there is a need in the mind of a person there is a chance for change. Just like how the remittance product is a success because of an inherent need of the client, it is necessary for the MNO to look out for the client’s needs and to create opportunities. But sometimes one can preempt a need or create a need--as suggested in the proposed model in figure 1--by being ahead of the learning curve of the client. Thus, this is one model by which a large percentage of Indian workers can be financially included. Given a reality where as per the UNESCO Report-2012, migrant workers make up about 30% of the population in India, there is a huge opportunity waiting to be tapped towards the benefit of this population such that they may be included in the economic, social, and political systems of the country. This blog reflects on the immediate impacts of the Senior Citizens Grant, a component of the Social Assistance Grant for Empowerment (SAGE) provided by the Government of Uganda. Digital payments geared toward changing the lives of elderly persons started with the SAGE pilot program in 2011. SAGE remits monthly stipend to beneficiaries aged 60 years and above through Mobile Telecommunication Network (MTN). Although mobile money services have existed for seven years in Uganda, they are still viewed as novel and mostly used by younger generations. With the mobile disbursement of SAGE, however, older persons in Uganda are gradually tapping into these electronic payment innovations. Initially, when SAGE payments through mobile money were introduced, many of the elderly beneficiaries were very confused. Most of them did not even have a mobile phone, nor did they have any knowledge of how to operate one. Others wondered how they would receive money from a phone -- a machine! This was further coupled with concerns from the older persons and politicians about whether MTN could smoothly implement the program, given the corruption in Uganda that has derailed most government programs in the past as well as the fact that mobile money was still a new technology to reckon with for the “born before computer” (BCC) generation. Nonetheless, senior citizens grants (SCG) beneficiaries are now encountering the reality of mobile money services. Payments to beneficiaries’ mobile money accounts are made through an instant e-money transfer service and are converted into cash by an MTN agent at designated pay points. All beneficiaries are given a five-digit Personal Identification Number (PIN) by MTN and also receive an identification card issued by the SAGE programme that MTN agents use for identity verification. This enables registered MTN subscribers to access their money through authorized MTN mobile money agents in their district. After verification, the recipient’s MTN card is inserted into the yellow talk machine to verify the balance on the mobile money account before paying out the stipulated amounts. While some beneficiaries do not necessarily grasp the entire process of effecting payment, they are aware of the amount that they are supposed to receive. Why MTN mobile money for SAGE cash transfer? Extending services nearer to older persons. Minimizing transfer costs through banks. Creating an enabling environment for the elderly who are mostly unbanked. Reducing risks associated with handling cash within the ministries. Reducing load on management and its associated challenges. Minimizing leakage associated with handling cash. Guaranteeing transparency and accountability for SAGE funds. The program was the first of its kind to be implemented by the government through MTN mobile money and it has been fairly effective and serves as a lesson for government, individuals, businesses and development partners. Overall, it has been observed that cash transfers through MTN mobile money has improved the nutrition of older persons and their families in Uganda. Over 90% of beneficiaries spend the largest portion of their cash transfer on food and the smallest proportion (10%) reported spending it on alcohol. Meals eaten by beneficiary households have greatly improved; unlike earlier older persons can now afford two reasonable meals per day for themselves and their families, particularly their grandchildren. A 69-year-old woman in Lwamata Sub County revealed, “Because of the availability of quality food, our grandchildren are now happy to go to school, are able to stay in school longer and learn better.” Another respondent in Kiboga town council said, "My grandchildren in lower primary can now carry food stuffs to school for at least three weeks from the time the payment is made by MTN, they are now willing to go and stay longer at school since they have packed food." Paying school fees is generally a major problem for most vulnerable families in rural areas. However, this is slowly changing with more efficient disbursement of SAGE cash transfers. According to older persons, with the little they get they are able to invest in school fees as well as buy scholastic materials for their grandchildren. This was confirmed by an 87-year-old woman who stated, “I have five grandchildren whose mothers died of HIV/AIDS. Each of them left children for whom school fees has to be paid. Through the SAGE cash transfer I have been able to educate three of the children up to primary six, senior one and four.” A head teacher was also quoted saying, “Most children in the SAGE households can now ably attend school. Their completion rate has greatly improved compared to before SAGE.” All of these findings are worthy of substantiation by future research. SAGE beneficiary households also tend to invest the grant in increasing productivity of farming and agriculture and the establishing small businesses. An elderly woman in Kibiga Sub County stated, “I regularly save a portion of my grant to cover emergencies, cultivation, meeting the basic needs of my household as well as saving to hire day-laborers to open up idle agricultural land”. 20-30% of SAGE beneficiaries regularly invest in agricultural production by buying livestock and other agricultural inputs and hiring ox-ploughs and day-laborers. While the mobile transfer of government assistance has contributed to the improved welfare of older persons and their families in Uganda, MTN has faced several challenges in the implementation of the SAGE program. Limited infrastructure and lack of a robust mechanism for controlling fraud has been a problem, particularly in Kole, Nebbi and Katakwi. In addition, there are only a few banks for mobile money operators to acquire the necessary floats for SAGE funds. Due to the large number of beneficiaries relative to MTN agents, elderly persons have to sometimes wait longer then anticipated to receive their funds and also face delays in the replacement of lost or faulty SAGE cards. Overall, however, the SAGE pilot program, remitting funds through MTN mobile money, has proved to compliment goals of ending hunger and poverty through financial inclusion of the unbanked. For more efficient delivery of services especially in rural areas, the SAGE programme has very good lessons to offer. Mobile money seems to be the most viable way to implement such programs and minimize the bureaucracy of government institutions and the resulting leakages and corruption that are common to many present governments in Africa. The views expressed in this blog are not necessarily those of the African Institute for Strategic Research Governance and Development. For more details, read Julius Okello's Final Report. To promote financial inclusion in India, the Reserve Bank of India (RBI), in 2006, proposed the Banking Correspondent (BC) model. Under this model, a lead banker is identified in each district to coordinate overall banking activities including the implementation of the BC scheme. Indian Overseas Bank (IOB) is the lead banker in Trichy District of Tamil Nadu, India. Other banks, including State Bank of India (SBI), Indian Bank, Canara Bank, ICICI Bank, HDFC Bank, also take part in the operations of BCs in this district. This post draws from data collected through a combination of a questionnaire as well as open-ended interviews with BCs in Trichy to discuss the acute financial, social and political challenges BCs face and to demonstrate why the RBI needs to seriously re-examine the design of the BC business model in India. 43% of the BCs in Trichy were female, while 56% of them were male and included one NGO. Even though the RBI envisioned the scheme to provide part-time earning opportunities for women within a particular village or locality (and also because the microfinance industry catered predominantly to women clients), we found that men dominated BC activities. The woman of the household often acquired the BC license but the male member (husband, father, brother, etc.) would implement the operations on a full-time or a part-time basis. Bank officials reported that in order for BCs to generate revenue, they were authorized to conduct operations in about 3 to 10 villages around their primary village. On average, each BC in Trichy region was managing about 1000 client accounts. This required travel, often at odd times that only men could fulfill due to India’s predominantly patriarchal society. The caste profile was the most interesting factor of our study. We found that only 25% were upper caste and the rest were Other Backward Castes (OBC), Scheduled Castes (SC), Muslims and Christians (See Figure 1). Village elders informed us that since BC services were provided to people of all castes at their doorsteps, this meant physically traveling to the segregated localities of Scheduled Castes (SC), Scheduled Tribes (ST), Muslims, and Christians. Social norms however, prohibit upper caste people from going to these localities. In addition, lower caste people were very eager to overcome their economic hardships and were willing to work hard and explore all opportunities available to them. For the male BC interviewees, 70% reported that it was their primary economic activity whereas for 82% of female BCs it was their only economic activity. The remaining 25% of male BCs rely predominantly on running their own kirana (grocery) shop or carrying out farming and agriculture, 4% of them depend primarily on their pension for their livelihood, while the remaining 1% are employed with other organizations for primary livelihood. Of the remaining 18% female BCs who have alternate sources of income, 16% carry out their own business, which could be in the form of photocopy shop, mobile recharge shop, kirana (grocery) shop, or other economic activities, while 2% work with another organization on a full-time employment and carrying out the BC activities on a part-time basis. About 70% of BCs were associated with Indian Overseas Bank (IOB), the lead banker for the Trichy region in implementing the financial schemes promoted by the Reserve Bank of India (RBI). We also collected information from other banks like State Bank of India and Canara Bank, but private sector banks like ICICI Bank and HDFC Bank were reluctant to share information about their BC operations. Most BCs had been associated with their institutions only for about 2 – 3 years for two reasons. First, if the BCs found that their organization was not sharing the losses or being helpful in developing clients, there was a habit of leaving and joining other financial institution/service providers. This was the case for many BCs that had shifted out of the State Bank of India. Second, the RBI has now begun pushing this scheme very aggressively and financial institutions only recently became active in implementing it. Though the RBI has been promoting the business of BC (also as a means of economic welfare for the BCs), it has not been very remunerative for the BCs. Our sample revealed that each BC was able to earn an average gross revenue of around Rs.7,000 per month. But BCs also incurred all operating costs related to running their business and 79% of the BCs had in fact suffered financial losses. BCs operate on an “Earn while you learn” model where they get training while running the business. As a result most BCs did not yet have a sufficient number of clients who trusted them with their accounts or money. Very few BCs had the large client base needed to make regular profits. A study conducted by the RBI in 2009, showed that BCs have to make a cash deposit of Rs.5,000. This deposit is collected to ensure that BCs have the necessary permits, to provide access to the technological inputs (including software, machines, etc. ), and also to safeguard the bank against possible default by BCs. But our study found that Trichy BCs on average made deposits of around Rs.33,951, significantly higher than the RBI data. Moreover, BCs invested resources towards premises, laptops, scanners, printers, and other hardware equipment (average of Rs.49,073). Many BCs have invested close to Rs.3,00,000 for setting up of the BC business. Assuming an interest rate of 12% per annum on this investment, a monthly interest charge of Rs.850 is used as notional interest cost in assessing the true financial health of BCs (See Figure 2). The data shows that BCs, on an average were incurring losses to the extent of Rs.1800. It is disheartening to note that most BCs have had to cover for these losses themselves, either by borrowing funds or by pledging gold or agricultural property. They invariably used their own funds and also borrowed funds to manage the liquidity in the business. Only 16 out of 143 BCs indicated that the bank or the financial institution made good the losses they suffered by reimbursing their expenses or paying them additional commission. BCs also faced other hardships, most of which are generally underestimated by researchers. Some BCs complained that their customers visited at all times, unlike banks that have restricted hours of operation. In such circumstances, BCs would lend from their personal money and go to the client’s place the following day to get the transaction ratified. In some circumstances BCs’ money would get blocked. Many BCs were also banished from their villages by political leaders. At times villagers thought that BCs were stealing the bank’s money. Relationships between local elected officials (Panchayat presidents who are eager to show off their influence in the region and who were often also operating as local money lenders) and BCs (who are obliged to apply the methods and guidelines of their employer in terms of account opening, pension payments, etc.) were also fraught with tensions. There were many instances where BCs were threatened, manhandled, and even beaten up by local elected representatives. In many ways, the life of BCs in Trichy district is not what the RBI envisions. They have been made to suffer undue financial hardships; they have been braving threats from local politicians, and also getting a tarnished reputation. In such circumstances, the high turnover of BCs is not surprising. Given this scenario, the financial viability of the business model proposed by the RBI and implemented by the banks needs to be re-examined to avoid a systemic collapse and prevent corruption that could bring disrepute to the entire scheme of BCs, the bank operating the scheme as well as the RBI. Read K.V. Nithyananda and Cyril Fouillet's Final Report. IMTFI Fall 2015 Newsletter is out! Read up on all the amazing activities that IMTFI and its researchers are up to: publications, books, presentations, in the media, collaborations, plus more & more research blog posts!